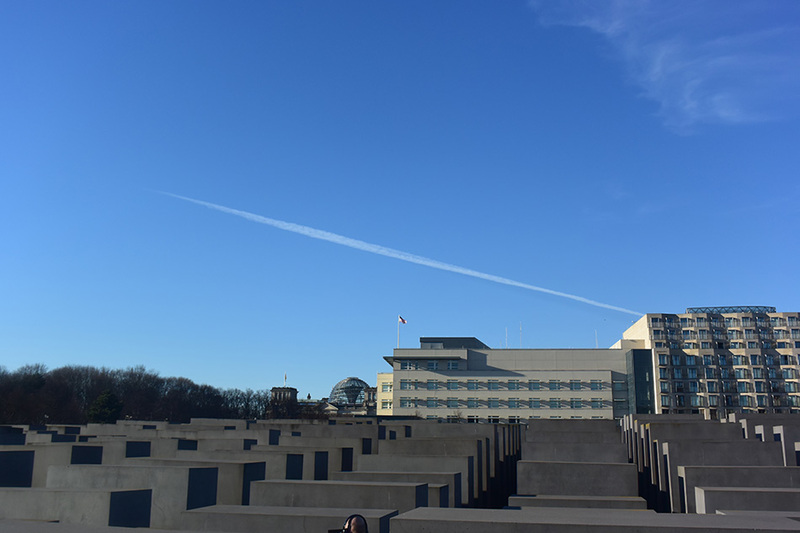 Photo: Wafa Mustafa / The Memorial to the Murdered Jews of Europe, short Holocaust Memorial in Berlin. Twenty-six years ago, my father gave me a name of a Palestinian news agency. By this, he marked me and shaped the entire identity I built afterwards. My father started a journey that included traveling four hours every week for almost eight years to participate in protests that supported the „Palestinian cause“ in the capital Damascus. In 2011, this journey took a different turn when an officer of the Syrian intelligence slapped me in a protest and yelled at me: „You Palestinian shouldn’t involve in Internal Syrian Affairs“. The reason for this slap was a necklace of the Palestinian map I had worn for ten years. I had to take it off after that day. As a Syrian, I was raised on the „Palestinian cause“ with all its details and updates as opposed to least mention of the holocaust memory. While living in Germany, I was confronted with an every-day presence of the holocaust. While I was strongly connected to „The Palestinian cause,“ I found myself confused about the holocaust and even scared of visiting memorials. Two month ago, I visited the Holocaust memorial in Berlin Mitte for the first time. After spending seven hours there, I left the place even more confused than I was before. I wasn’t only shocked by what I saw but also by what I felt about what I saw. This story started in the „room of names“ as the information center calls it. On the big white screens, I saw names coming up and going. I listened to their stories. Some of them had dates of birth and death while some other didn’t. For some reason , I left the place only with the name of Matka Farbe whose story didn’t have many details nor any dates. Two days later, a 40 years old woman visited me in my dream. Wearing a beautiful long dress and tiding her hair up, she was looking at me, smiling in silence. I knew it was her. „When were you born and when did you die?“ I repeated the same question again and again. Matka never answered my question. She would just keep looking at, smiling in silence. I woke up that day with a different fear and so many questions that were getting more complicated as she kept appearing in my dreams later. Why does she come to me? Why is she always silent? Why do I keep asking the exact same question? Dates? Numbers? Since my father got arrested by the Syrian regime in July 2013, I started counting the days of his absence. I don’t really know why or how I made this decision, but what I know is that I became obsessed with numbers since then. The fact that even if my father died in prison, I wouldn’t know an exact real date of his death, made me even more sensitive about this. It has been 1373 days since he left the world I know. Since then, he keeps visiting me in my dreams. Most of the times, he would just be there, looking at me, and smiling in silence. 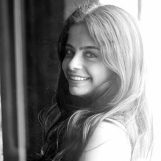 Is it a coincidence that Matka appears the exact same way in my dreams? What does that mean? Who is she? Is she my father? But she’s dead! Does that mean that my father is also dead! Is she trying to tell me that! I couldn’t bear this idea. I had to look for Matka and try to understand this relationship between her, my father, and me. I googled her. I wrote Matka Farbe. She doesn’t exist on google. So I decided to visit the memorial and listen to her story again. I went there and waited for a while in the „Room of names.“ Again, I listened to many stories .she didn’t appear. I looked for her everywhere. On every wall, in every image, in the faces of people walking around, in the sound of the children playing hide and seek between the pillars. I couldn’t find her. Eventually, I went to the book shop at the information center and asked about her. They told me that no one knows when she will appear again and if I had to listen to all names that would take six years, seven months and 27 days. I wasn’t only surprise, I was more disappointed. I felt that I lost her. But I couldn’t accept that. I asked them to help me finding her. They asked about her name. „Matka Farbe“ I said. „The name doesn’t exist“ they said. Apparently, her name was mafka Farbe. It wasn’t T. It’s a Polish name and it’s pronounced Mawfka. They gave me a paper that show the few information the memorial has about her. It says that they estimated that she was six years old when she died. Six years old! But the one I saw in my dream was older, much older! I blamed myself for not knowing that she was just a child. However, after that moment everything changed, I realized that Mawfka was me. She was the child inside me who wrote her father in his absence. أنا لم أكبر في غيابك أبي ..
„كيف يُــقـتَـل الفجر بقذيفة دبابة“ ! هو أكثر الوقت إيلاماً أبي ..
لا يتوقف هذا العالم عن الدوران في رأسي! تحترف -مثلي- تأمل السقف المرتفع ..
تستنزفني ذات السنوات الست يا الله، وعبثاً أحاول جعلها تنام الليلة أيضاً. I am that girl full of many images. „How could the dawn be killed by a shell fired from a tank“! It’s the most painful time dad .. This world does not stop spinning in my head! and in vain I try to make her sleep tonight too. In the beginning of this journey, my aim was to explore the holocaust, but ever since I met Mawfka and she started appearing in my dreams I realized that I was exploring myself. „It happened, therefore it can happen again: this is the core of what we have to say“. Said Primo Levi who survived the holocaust in 1945 and died in 1987. His biographers assumed that he committed suicide. It raises even more questions in my mind now. Do we really survive? Did I survive by leaving home and not getting killed there? Will I ever know if I survived?